The relationship manga had with the 3/11 disaster. insert_drive_file A blog documenting the repoening of the ishinomori Manga-museum. Seems to have been a big deal for the community. insert_drive_file This is the main website for the Ishinomaki manga Museum. They have archived posts which detail what happened and how they received support and how the revitalization was progressing. insert_drive_file The world premiere of a new movie for the cyborg series in ishinomaki, at the Ishinomori Manga Museum (Ishinomori家 is from 石巻). One of the things he mentioned in his speech was how proud he would be to show it here in Ishinomaki for hte first time, despite recovery still going on (this was 2012). Keeping up the spirit. insert_drive_file Article talks about Manga as a means to have discussions about certain topics... to bring things into LIGHT! Since it is more easily accessible than others. Some manga have highly politicized messages, or pleas for belief about some things, while others just tell stories. Manga ran the gambit during 3/11. insert_drive_file Manga as a means to explore human emotions. Author was reflecting on the comfort and fortune she experienced by living inland in Iwate, as opposed to though who lived in coastal regions. Sense of guilt for being happy in times a mourning. Manga as a means to explore these ideas. 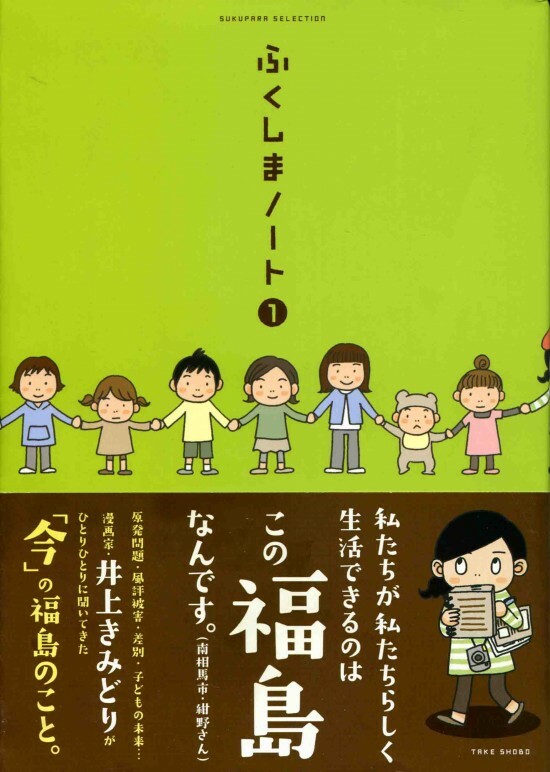 insert_drive_file A manga talking about the hardships but also the community that victims of the disasters found in relief shelters. insert_drive_file Currently in possession, will read soon. Interesting thing to note is that the author is actually from Sendai, and went to Fukushima to figure out people's stories. insert_drive_file Article about an essay manga warning about the experiences of the earthquake soil liqufication, and the many struggles that came with rebuilding. insert_drive_file Manga as a means to tell stories from the actual event, display ways in which people are recovering and what is still left to do. insert_drive_file "Eager" was the local hero of the town of Onagawa in Miyagi Prefecture. 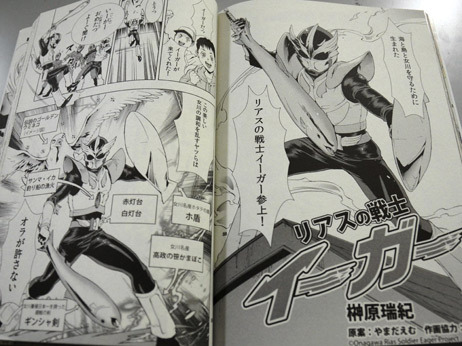 After the earthquake, he was included in a manga made to support victims of the earthquake. insert_drive_file A collection of art from artists in Japan and other parts of the world. Contains imagery to talk about the calamity, also has bilingual components. Also on sale for charity. insert_drive_file A blog post. Discussing this manga collection prodcuded and edited by 11 manga artists throughout Japan, who had gone to the region to talk with people and hear people's stories. A way to raise money, charity for victims and communities of the 3/11 disaster. Seems really popular. Large impact through the world of art. 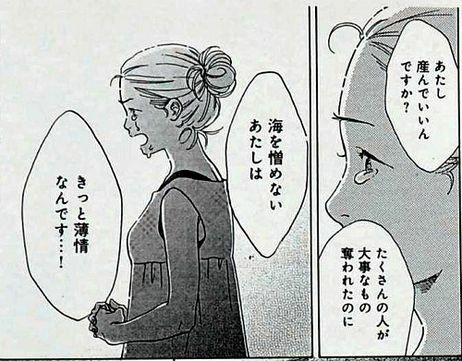 Interesting, in this blog, one of the manga artists talks about how she was worried about how to present certain things, how to talk about things neutrally. She didn't want to get things wrong, but felt lost in deciding what to include. Also said she didn't want to hurt people. This sense of truth & objectivity. Overall, learned alot about her own humanity it seems like. insert_drive_file The blog for the 311 stories manga series, they also have other volumes, and a three years later volume as well. But again, the people who wrote these volume are not necessarily from Sendai. insert_drive_file Another example of the ways that manga is contributing to the community in concrete ways. Charity. 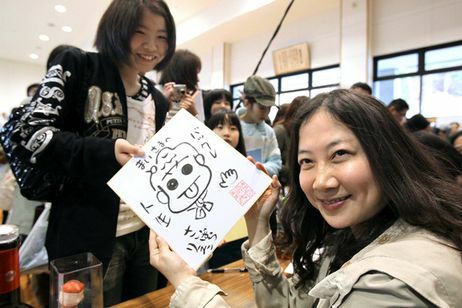 All the proceed of their manga books went to helping orphans from the tsunami disaster! interestingly enough, this was how they saw they could best help people. Included two arists from the affected prefectures (Iwate & Miyagi) and famous mangas as well. insert_drive_file Manga artists gathering to give drawings to kids and families affected by the nuclear inicident. Community outreach, volunteerism. Kids were really excited to meet them, see them. Brought up their spirits. Interestingly enough, one artists said that people have to help the affected area, and buy more fod from Fukushima to support people. insert_drive_file While manga has certainly had the opportunity to raise money and tell people's stories and lift people's spirits, it also certainly can have a negative effect. 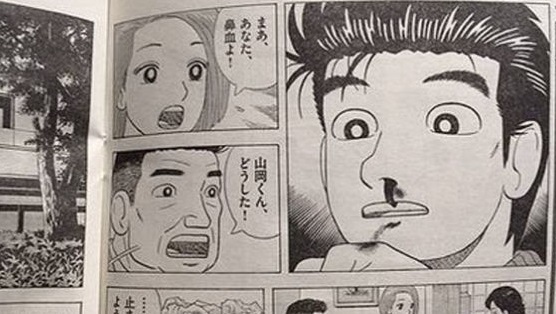 A long-running manga had a chapter where the main character was in Fukushima. People reacted negatively because the portrayals were allegedly based in fiction as opposed to reality, and sensationalized what had happened there. 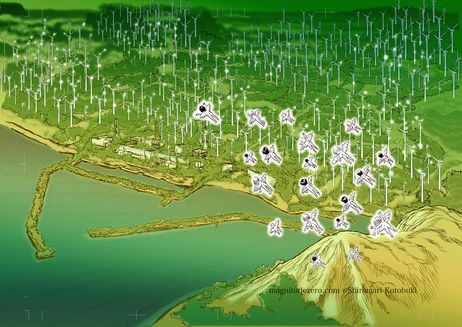 Ultimately, the residents and government of Fukushima criticized it as harmful to the industries and image of the region. insert_drive_file Politics of bringing certain issues to the forefront... Oishinbo was suspended for portraying Fukushima as unsafe from the nuclear disaster. 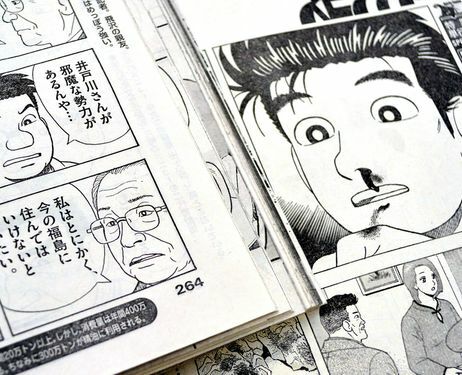 More calls for authors & editors to meet with people in Fukushima + added scrutiny "Katsutaka Idogawa, the former mayor of a town in the area, also talks about how he has had nosebleeds since the accident. In real life, Idogawa, who left his job after a vote of no confidence, has been a vocal critic of the cleanup efforts, and after the manga appeared he posted photos of himself with bloody tissues on his Facebook page." ----> Trying to share the truth? Acting a news reporter, but is it too irresonsible? - Ironic, in a sense no? insert_drive_file Finding blame in manga? Apparently, people are critiquing Tezuka, and his family for propagating the idea that nuclear energy was safe nearly half a century ago. They say his work how we have gotten to the incident at hand. Politically charged, based on content and messages of certain media. insert_drive_file Manga as political. 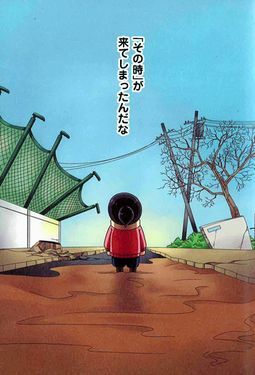 A manga artist reaffirming his position as anti-nuclear following the Fukushima nuclear disaster. Specifically, he claims that Japan should ditch the "old science" of nuclear energy, and also takes aim at the "nuclear village" a term used to describe the lobby of nuclear energy leaders, politicians and media members that sell nuclear energy as safe, clean, and cheap. 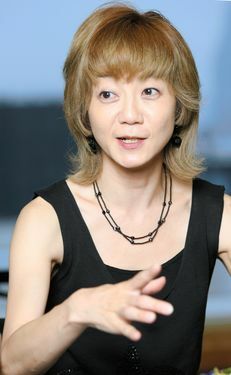 Says that Japan should start an energy revolution. insert_drive_file A Manga Train, was used this past summer in order to revitalize tourism in Tohoku, very recent development. It's been 5 years, is it time to improve the situation of the Tohoku? Apparently this project was not only put on by the JR train network in Japan, but also the 大震災出版対策本部 which is this organization that was formed in ON March 23rd 2011 to help the Tohoku region recover from the disaster. Primarily, it has done stuff like give books to kids and help revitalize and reconstruction libraries, and essentially promotion literacy as a means to foster a sense of community in the region once again. insert_drive_file Movie about how two high school kids were curious about their futures. One stayed in Tohoku to be help his dad as a fisherman, but ended up also helping the community. Another girl wasn't too sure about her future, but she became a doctor and came back to Tohoku because otherwise she would've felt guilty. 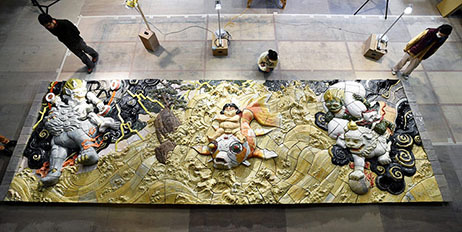 Not only immediate recover, covers from Heisei 23 to 25.
insert_drive_file The creator of the one the most critically acclaimed and representative anime movies (Akira), Otomo created a mural (ceramic relief) that has been displayed in Shizuoka, it will be moved to Sendai aiport. He says that the mural is supposed to get children who did not experience or remember the 3/11 dissasters, to get them interested in it. insert_drive_file The actual image itself, apparently Otomo said it was meant to reflect the youth of today going forward into the future (alongside thunder and wind). insert_drive_file An anime created by Zapuni LLC. What is interesting about this anime is that it was actually a joint effort between Japanese animators and I believe English musicians. The plot revolved around these angels praying for the sun to come out to help Tohoku revitalize. A few weird things were present, however. All the angels were young females, why not older people, why not males? The creators also mentioend that they said they felt like angels, because there was nothing more they can do but pray, is that what the situation was like for many other Japanese? insert_drive_file Video presentations of what the stories of certain mangas from the 3/11 are trying to convey. According to this professor, Story 3/11 and its secquel raised $100,000 for affected areas. 28:16 - How people are overreacting about radcioactivity in Fukushima, focuses on the troubles & the damagaes and harmful rumors caused by misiniformation. 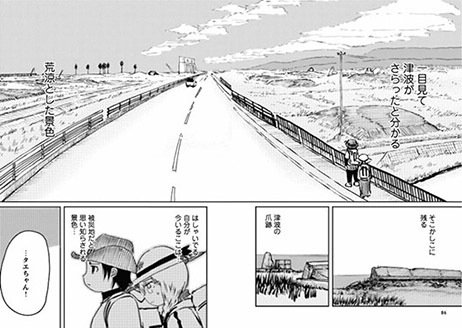 Fukushima No-to ---- 33:00 Journalistic Mangas, covers individually in details. One's situatio could vary widely, depending on the amount of radioactivity.